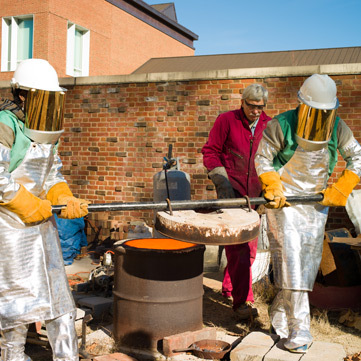 Each member of the Art Department, whether faculty, staff, or student, is responsible for knowing and observing University of Virginia Environmental Health and Safety (UVA-EHS) and the McIntire Department of Art, Studio Art Environmental Health and Safety (SA-EHS) Policies. The goal is to develop positive attitudes regarding health and safety among all faculty, staff, and students within the studio program. It is essential that all members take an active part to initiate and enforce preventive measures to control hazards associated with activities under their direction. The purpose of this policy is to set forth general guidelines for the Studio Art Department as Individual Studio (Area-Specific) Safety Procedures. Individual studio safety procedures are essential in providing a safe and healthful performance of art activities and the safest possible working and educational environment for faculty, staff, and students. The Art Department Individual Studio Safety Procedures will follow the provisions of the University EHS Program and any other applicable local, state, and/or federal regulations. Require students to use personal protective devices and clothing as needed for the proposed instruction or activity. Such devices and equipment must be maintained in good repair.